French Anthro Comic: Intégrale Chlorophylle – Book Review by Fred Patten. Intégrale Chlorophylle 1, by Raymond Macherot. Brussels, Belgium, Le Lombard, October 2012, hardcover €25,50 (208 pages). Intégrale Chlorophylle 2, by Raymond Macherot. Brussels, Belgium, Le Lombard, November 2012, hardcover €25,50 (208 pages). Intégrale Chlorophylle 3, by Raymond Macherot. Brussels, Belgium, Le Lombard, April 2013, hardcover €25,50 (206 pages). 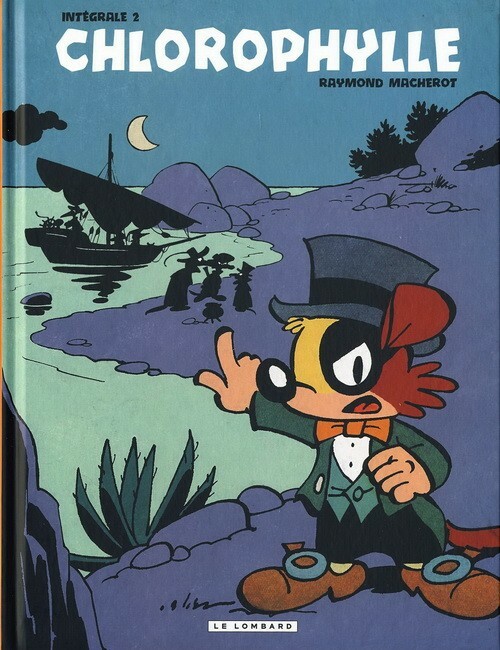 Raymond Macherot (1924-2008) didn’t invent the French-language animalière cartoon strip. Hergé, the creator of Tintin, dabbled with it in his 1931 Tim L’Ésureuil, Héros du Far-West (Tim the Squirrel, Hero of the Far West), and again in his 1934 album featuring the bears Paul and Virginia, Popol et Virginie chez les Lapinos. (The Lapinos were a tribe of rabbit Indians, renamed the Bunnokees in an English translation. Hergé was a fan of early Western movies.) Edmond-François Calvo (1892-1957) created the first memorable animalière with his classic two-volume history of World War II with funny animals, La Bête est Morte (The Beast is Dead, 1944), which resulted in Calvo in France getting an invitation from Walt Disney to come work for his studio in Hollywood. (Calvo declined.) Calvo drew several other comics featuring adorably cute animals during his career, but they were mostly innocent pets. 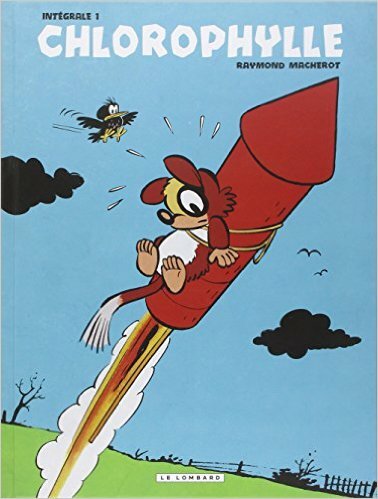 It was Macherot who established talking funny animals as a viable category of French-language comic strips from the 1950s to the 1990s when he retired. Macherot created several other popular series, not all featuring funny animals – his light adventures of human British secret agent Colonel Clifton are still reprinted – but his Chlorophylle the dormouse, serialized in the weekly Tintin magazine from 1954 to 1966, Sibylline the field mouse, Inspector Chaminou (pretty kitty) of Zooland’s Royal Secret Police, Mirliton the housecat (written by Raoul Cauvin), and other funny animals are what Macherot is most remembered for. Full disclosure: I was a BIG fan of Chlorophylle when I discovered his adventures while in college. When I joined the furry APA Rowrbrazzle in 1984, my contribution’s title was a Chlorophylle reference. Now, thanks to these three Intégrale Chlorophylle collections, here they all are, with pages and pages of biography about Raymond Macherot, photographs from throughout his career, original Chloro magazine serial covers, individual Chloro album covers, and lots of Macherot ephemera – minor series that disappeared after only one or two stories, one-shot drawings in Tintin’s true-life nature articles of the 1950s, samples of his few realistic comics, and more. Intégrale Chlorophylle 1 includes Macherot’s first five serials: the four-page Mission ‘Honeysuckle’ (which is really a pre-Chloro adventure), the 32-page Chloro Versus the Black Rats, the 47-page Chloro and the Conspirators, the 39-page No Salami for Célimène, and the 20-page The Haunted Wood. These introduce Chlorophylle and his pals and enemies: Chloro the dormouse, Torpedo the Otter, Serpolet the rabbit, Minimum the mouse (who rapidly becomes his closest companion), Bitumen the Crow, and the villainous Anthracite the black rat and Célimène the housecat. In this beginning, Chloro and the others are natural woodland animals living in the Tranquil Vale. Anthracite, the villain in Chloro Versus the Black Rats and Chloro and the Conspirators, is apparently killed. Chloro and Minimum are called to a small town to play animal detectives in No Salami for Célimène, which involves them in a Tom-&-Jerry cat-vs.-mouse household adventure; and the two return to being small woodland animals in The Haunted Wood. The stories in Intégrale Chlorophylle 2 are the 46-page Les Croquillards (a French pun/reference meaning roughly carnivorous troublemakers), and Zizanion the Terrible, and the 30-page The Return of Chlorophylle. Chloro and Minimum hitch a ride on a heron migrating to Africa for Minimum’s health, but they are blown off during a storm over the Mediterranean and are cast away on the unknown island of Coquefredouille. They discover it and its capital, Le Fourbi, to be a pre-World War I-era funny-animal kingdom ruled by ineffectual King Mitron XIII, a white mouse. Chloro and Minimum quickly learn to wear clothes, drive an automobile, and get jobs as journalists. But they soon learn that this is where Anthracite ended when they thought he was dead. Since Anthracite is a confirmed villain, he has spent most of his time locked up in Le Fourbi’s prison, but he escapes and decides the best way to avoid being arrested again is to become the new dictator of Coquefredouille. King Mitron and the island’s new supporting characters — Police Commissioner Bouclette (hedgehog) and Inspector Poulet (chicken) – are comedy-relief stumblebums, so it’s up to Chloro & Minimum to save Couqufredouille. In The Return of Chlorophylle, Chloro & Minimum get homesick, return to the Tranquil Vale in an ascension balloon, and teach their animal friends to wear clothes so they won’t freeze in the snowy winter. When Chloro disappears, Minimum and Mironton, another dormouse, search for him. But reader reaction showed that the stories set in the funny-animal Kingdom of Couqefredouille were the most popular. Intégrale Chlorophylle 3 contains three 30-page stories: Anthracite’s Revenge, Chlorophylle Plays and Wins, and The Ferret Gastronome; plus the 44-page Chloro to the Rescue, and the 4-page The Klaxon of Truth. Anthracite’s Revenge and Chlorophylle Plays and Wins are a single two-part story, set in a Coquefredouille now shown as a modern civilization, with current cars and jet planes. Anthracite escapes from prison again, gets control of Coquefredouille’s super-bomb, and blackmails his way to the throne. Chloro, Minimum, and Torpedo, vacationing in Coquefredouille, stop him. The Ferret Gastronome is an unusual story set back in the Tranquil Vale. The three Mirliflore juvenile delinquent mouse brothers try to push the other animals around during Chloro’s, Minimum’s and Torpedo’s absence. Mironton tries to stand up to them, but is continually beaten until after eight pages, Chloro & Minimum return and throw the mouse bullies out. The Mirliflores hope to regain their dominance with the help of Tournebroche the ferret, but the ferret sees no reason why he shouldn’t start by eating the Mirliflores themselves. Chloro agrees to save the Mirliflores before the ferret can eat them and then go after the other Tranquil Vale wildlife. Chloro to the Rescue was Macherot’s final significant Chloro adventure, set in Coquefredouille again. Two unscrupulous arms merchants manufacture a war between Coquefredouille and the neighboring island Kingdom of Cynocéphalie (ruled by monkeys), to get rich selling weapons. Anthracite escapes prison just then and tries to kidnap Coquefredouille’s ace fighter jet pilot, but he gets inept Corporal Beauminet (cat) instead who is just learning to fly. Beauminet’s and Anthracite’s aerial misadventures make most of the story. The Klaxon of Truth, Macherot’s last Chloro story, was a four-page “behind the scenes” trifle showing all the animals of the Tranquil Vale including Anthracite to really be friends together when they aren’t acting an adventure. After that, Macherot went over to Le Journal de Spirou, Tintin’s weekly rival, and created new animalière series for it for the rest of his career. Tintin tried to keep Chlorophylle going with new writers and artists — Intégrale Chlorophylle 3 shows some of their covers – but none of them caught on. Here, in three collections, are all of the Chlorophylle stories that arguably started French funny-animal comics. 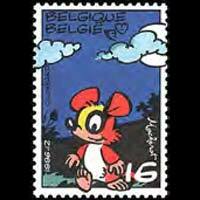 The Belgian government issued a Chlorophylle postage stamp in 1996. Raymond Macherot (1924-2008) began creating French-language (Belgian) comics for the weekly Tintin magazine, published by Le Lombard, in 1954. He was best-known for his Chlorophylle (funny animal) and Colonel Clifton (human) series, serialized one or two pages a week for usually 46 pages. 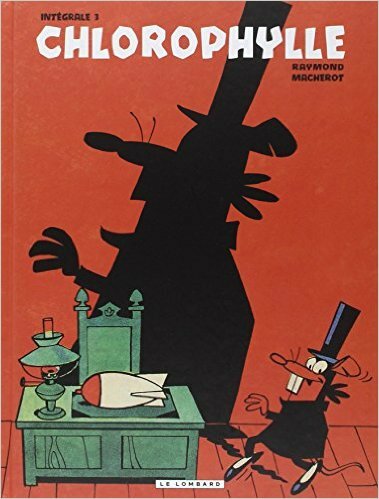 In 1964 Macherot moved to the rival Spirou magazine, published by Dupuis. He wrote/drew for Spirou, creating Sibylline (funny animal) and others that he wrote but did not draw, until he retired in 1990. In Europe books have been written about Macherot and his comics. Practically all of Macherot’s series were reprinted as album books, not just once but many times. Macherot regularly received royalties on them, and his heirs get those royalties today. I don’t know whether Macherot got rich from them, but he was able to live comfortably in retirement from the royalties that he received on his published work. Compare this to American comic-book creators like Carl Barks, Jack Bradbury, or even the action/costumed-hero creators like Jack Kirby. Did they get anything from reprints of their work? No. Their publishers owned 100% of their work. Many thanks and a hatlo style hat tip to Mr. Patten for turning me on to The Beast is Dead. I saw this is a bookstore 5 years ago and was unable to find it by searching the net. I knew the second I saw it mentioned in your great article that this is what I was looking for. Couldn’t have found this without Dogpatch Press, many thanks.